The good old days where the latest news, styles, and tastes made their way to us through dead trees rather than dead hyperlinks. Our Polish friends at Turbokolor are harking back to these times and paying their respect to five magazines still in print today that have helped motivate them over the years, including us of course. They’re doing this with a limited edition series of t-shirts each designed by Swanski in collaboration with one artist selected by each magazine. Modart chose East Eric to fight it out with Swanski and come up with a perfectly fitting message for the occassion. In addition each t-shirt comes packed in a box containing also a current copy of the collaborative magazine. 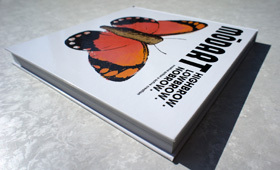 And since Modart is only published now as a book, Turbokolor x Modart t-shirt will come with a book instead of a magazine. The series premiers in late April.